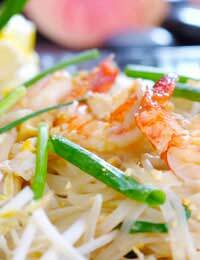 Chillies and prawns make a tasty and simple dish that requires minimum fuss and preparation. This winning combination makes an excellent choice for supper or lunch and can be made to go further with the addition of one or two simple accompaniments. It takes about 20 minutes from chopping board to table but has the flavour and class of a dish that takes much longer! Use the best prawns you can get hold of! If you have some good quality raw prawns to use, instead of processed ones, so much the better. Check defrosting guidelines when using frozen prawns. Heat the oil in a wok, heavy-based frying pan, or skillet. Quickly fry the shallots, garlic and chilli together for 2-3 minutes so that they soften and colour slightly. Next, add the canned tomatoes (or peeled, seeded and chopped fresh tomatoes if you have them.) Stir all the ingredients together and then add the tomato puree, bay leaf, thyme and white wine. Allow your ingredients to come to the boil then reduce the heat to a gentle simmer. Cook gently for about 10 minutes and stir thoroughly every 2-3 minutes. When the sauce has thickened satisfactorily, remove the herbs and just bin or compost them. Have a little taste of the sauce-season with salt if required. Now to your final and very important ingredient, the prawns!You may want to rinse and drain the prawns first, then pat them dry on absorbent kitchen paper, before adding them to the other ingredients. Simply stir the prawns into the tomato sauce mixture and allow them to heat through. This should only take a few minutes but they must be thoroughly heated through before serving. Tear the basil leaves roughly by hand to scatter over the finished dish.Once the prawns are thoroughly heated, your dish is ready to serve-either straight from the pan, or from a warmed serving dish. Some of our tried and tested accompaniments for this quick and simple meal include rice, noodles, pasta or mini baked potatoes, served with a fresh green-leaf salad. Another favourite is to serve the chilli prawns with hot crusty garlic bread. So much taste, so little work!